We have represented the interaction between a worker and an employer as a game in which the employer chooses the wage, and the worker responds by choosing how hard to work. In this Leibniz we describe the mathematical properties of the worker’s response. To model Maria’s decision fully, we could start from her utility function, and solve her utility maximization problem to find her best response to each wage. But in this unit we are focusing on the interaction between Maria and her employer. So we skip this step and simply describe what shape we would expect her best response function to have (so that we can draw it) by thinking about how she makes her decision. The best response function we drew in the text has the shape shown in Figure 1. 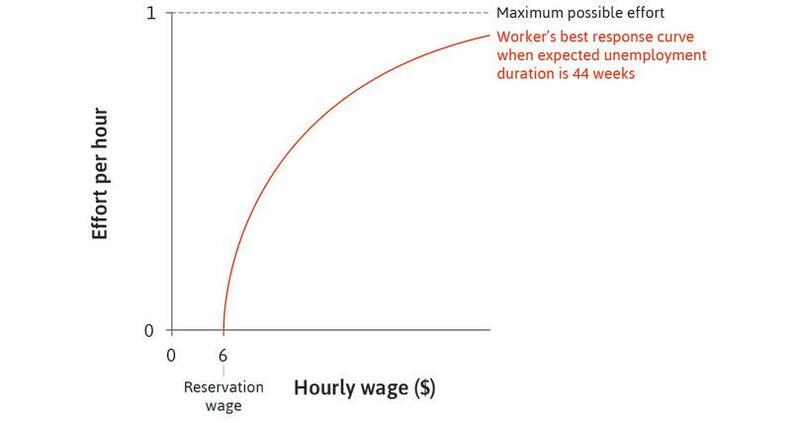 The wage chosen by the employer is on the horizontal axis, and the corresponding level of effort chosen by Maria is on the vertical axis. Figure 1 Maria’s best response function.